To define the vision for the Master Plan of the Santee Water Park and Recreation Center, Counsilman-Hunsaker attended the 2013 Advanced Planning Charrette for the proposed Santee Waterpark along with representatives from Orangeburg County, the Town of Santee, LS3P Associates, and ADC Engineering. The town’s master plan consisted of an outdoor waterpark, recreation fields and courts, and supporting ancillary structures. Counsilman-Hunsaker discussed aquatic user groups, pool programming, aquatic amenities, and examples of facilities similar in size and scope to the one proposed. 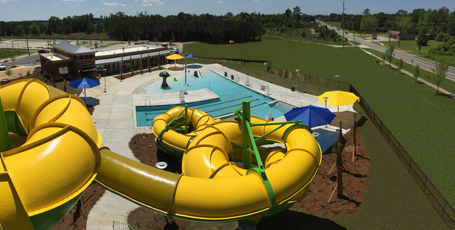 The session concluded with representatives from Orangeburg County and the Town of Santee indicating their preferences for the waterpark amenities. Three concepts for the recreation fields, courts, waterpark, and associated preliminary cost information were reviewed. A concept was selected for the recreation component and direction was provided to the design team for further refinement of the waterpark. After two decades of planning, officials welcomed the grand opening in June 2015, celebrating the completion of the new recreation center. The Santee facility features an aquatic center, basketball and tennis courts, baseball fields, a soccer field, and pavilions. The 5,500 sq. ft. water park features zero beach entry and stair entry, spray features, three 25-yard lap lanes, a waterslide, and various spray features. It was designed with the intent of future expansion in mind for a community that is passionate about aquatic recreation. The park was built between the partnership of Orangeburg County and the Town of Santee. It’s funded through a countywide one percent capital projects sales tax, also known as the “penny tax”, which is one penny out of every dollar spent in Orangeburg County goes into a fund, which allows the citizens to choose projects.